Even though we loved The Force Awakens, it left us hoping that we'd get to see way more of Captain Phasma in the near future. Her character looked and sounded so intriguing onscreen that we'd love to sit down with her for at least another hour or two, so that we could ask all our most pressing questions about her backstory! We especially want to know more about the origins of her unique stormtrooper armor and blaster. After that, maybe we'd move on to bigger topics, like the history of the First Order and the Resistance. If things were still going well, we could try to convince her to give up a couple of big secrets. Like who is Supreme Leader Snoke, and where is that huge hologram coming from? Although there's a chance that a question like that might earn us an unpleasant face-to-face meeting with an interrogation droid. Okay, maybe it would be prudent to abide by that old Earth saying about curiosity and cats—at least when we're talking about the ruthless leader of a blaster-wielding space army. 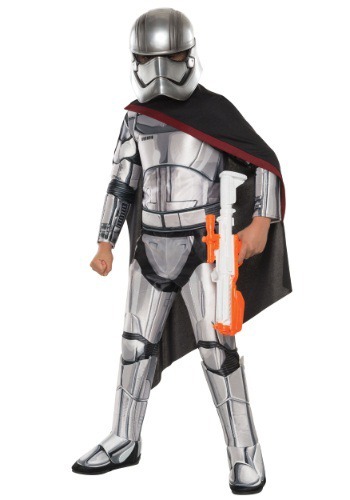 That's why we can't recommend this high-quality Child Deluxe Star Wars The Force Awakens Captain Phasma Costume highly enough. Because you don't seem like the type of person who's looking to turn our love of Star Wars into an excuse to torture somebody or lay waste to a thriving cantina. At the same time, her distinctive cape and polished chromium armor look so good that we can't wait to see them in action again!